So, you want to choose the perfect accessories for your wedding dress. You definitely don’t want the accessories to take away from the dress, but rather compliment it. After all, it is one of the most important parts of your day. It all comes down to your personal choice and what the dress is like. Does your dress already have a lot of embellishments, or is it on the simpler side? Is it low cut, or does it have a higher neckline? Is it ivory, white, or more of a champagne color? Will you be wearing your hair up or down? The answers to these questions can help you determine what accessories may be right for you on your wedding day. There are some general rules to follow when it comes to choosing a color for your accessories. While you should always choose what makes you feel the most beautiful, it’s always good to think of what matches your dress the best. Ivory and gold pair very well together. The gold brings out the ivory tone. If your dress is pure white, try out some silver accessories. These tones mesh better together and gold tends to clash. If your dress is embellished, choose your accessories based on what pairs best with it. Again, it’s your day. So, if you feel that gold washes you out and silver looks best with your ivory gown, go for it! You are the star of the show, after all. A lot of the time, less is more when it comes to your wedding day. If your dress is covered head to toe in embellishments, you might consider forgoing the heavy jewelry. A simple pair of earrings and your smile might be all you need. A pair of drop earrings compliments your gown much more than any necklace could, especially if your dress has a detailed neckline. If your gown is on the simpler side, a necklace might be for you. Test out different options and choose what feels right. Jewelry and a lot of bling may not be your style, but what about a sash or a belt? A beautiful sash or belt can say a lot on a dress. You can work with your salon to create a custom one, tailored to your style. You could also choose a simple, colored sash to add something extra to your gown. At the end of the day, it’s your wedding, your dress, and your day. If you love a lot of bling, go for it! Work with your salon and try on all of the accessories you want. Your bridal consultants will be more than happy to help you choose the accessories that work best for you and your gown. When you want your wedding to seem like a star-studded event, without the stars (most likely), then dressing like one and selecting a venue like one might be the next best thing. Celebrities have a knack for finding the most beautiful and elegant venues you could imagine. Of course, it helps that they have quite the budget, but that doesn’t mean you should let that get you down. Where there’s a will, there’s a way, and you shouldn’t let price or location stop you from having your dream wedding. If The Notebook is your thing (and how could it not be? ), then this is the venue for your wedding day. This is Allie’s summer house in the classic romance movie and the wedding venue of the one and only Blake Lively and Ryan Reynolds. Yeah, it doesn’t really get much better than that. The plantation is simply beautiful, and the driveway is lined with oaks and Spanish moss, which make for some stunning photos. Jessica Simpson and husband Eric Johnson were married on this not so subtle ranch in California. With what seems like a never-ending garden, this ranch is what outdoor wedding dreams are made of. Just look at those flowers and the greenery stretching all the way to the mountains. A wedding in Italy is nothing short of a dream come true. Jessica Biel and Justin Timberlake got to live out every girl’s dream at the Borgo Egnazia Resort in Italy. Planning your dream wedding is exciting and you deserve a day to feel like a celebrity! Check out Martha Stewart Weddings for more fabulous celebrity venues! So you and the love of your life are going to tie the knot, and neither of you wants to wait over a year to make it official, or maybe you want to keep it simple and budget-friendly because you’re in the process of buying your first home. Or perhaps you’re looking for a reception dress and have a smaller budget for this purchase. Whatever the reason for needing to find a gown in a hurry or keep your finances in check, buying a brand-new designer sample gown might just be the ticket to wearing your dream dress, no matter what your circumstances. There are a variety of ways to look for sample wedding gowns. Many online shops offer quality designer bridal gowns for sale at discounted prices, but because these dresses have been discontinued, there is almost no way to try them on locally before buying online, let alone check over the dress for wear and tear. 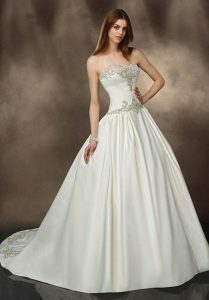 At Aleana’s Bridal, we offer sample wedding gowns at 50% off (or more). From the moment we buy a sample for our shop, our gowns are always kept in plastic garment bags to keep them clean and in excellent condition. 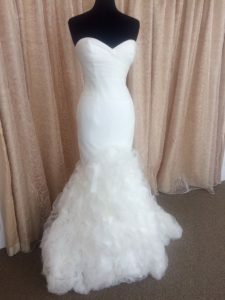 We have sample gowns available from Pronovias, Rosa Clara, David Tutera, Allure, Jasmine Couture and more. Maybe you’re looking for something boho chic for your rustic wedding, or perhaps you are thinking on a grander scale — a fairy tale ball gown for your big day. We have a large selection of styles, from sleek sheaths and fit ‘n flares to full A-lines and ballgowns. So all you New York and New Jersey brides out there searching for your perfect wedding dress at a fabulous price, you can find your beautiful bridal gown in northern New Jersey at Aleana’s Bridal in Paramus, the heart of Bergen County. Our Cash & Carry gowns means you can take home your dream dress the day you try it on, and no one will be the wiser that your top quality designer gown was bought at a bargain price.